The rally was an opportunity for farmers, environmentalists, politicians and citizens to put both the government and the opposition on notice. Thousands marched from Parliament House to Prince Alfred Park on Saturday to demand that the government abandon coal and gas mining in favour of environmentally sustainable alternatives for a clean future. Approximately 5,000 people were expected to be in attendance at the rally, but these numbers were easily exceeded, with police along the route to Prince Alfred Park estimating a figure closer to 10,000. Participants travelled from all over NSW to represent their communities. There were people from the Pilliga region, from Narrabri, from Gloucester and Wollongong. Sydneysiders came from the Northern Beaches and the Blue Mountains. Farmers travelled with their horses from Inverell and Murrurundi. The Time2Choose rally was organised by a number of organisations including Lock the Gate Alliance, The Wilderness Society, 350.org, Australian Youth Climate Coalition NSW and the Nature Conservation Council of NSW. Lock The Gate described the importance of the rally, as the state has reached a “crossroads”. Student activists joined the march, with the University of Sydney Enviro Collective in attendance, and the Australian Student Environment Network (ASEN) hosting ‘EARTH Power Against Coal & Gas’ at Stucco student housing to celebrate art and stories that help inspire their activism. Environment Officer Natalie Berry, who spent eight hours occupying a tree over the rail at Adani’s Abbot Point coal terminal in January, knows the impact that student involvement has on large scale environmental campaigns. The date of Time2Choose is deliberate. 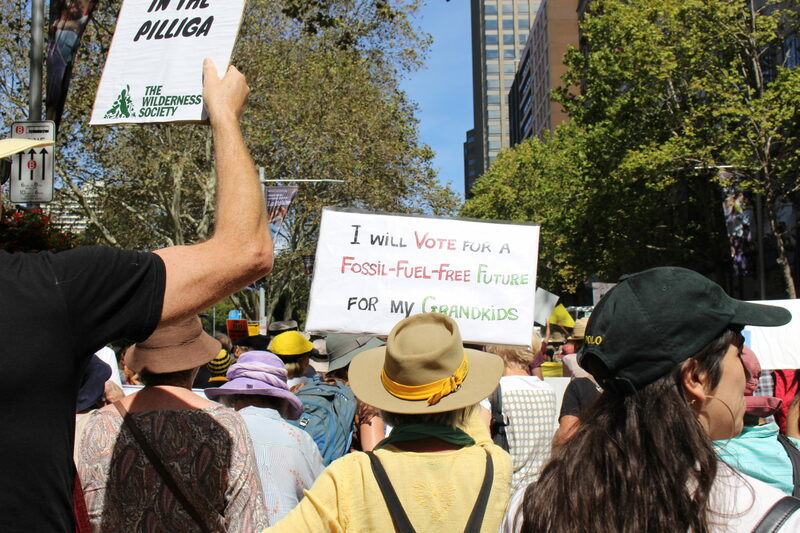 March 24th marks one year to the day until the NSW state election, and this rally was an opportunity for farmers, environmentalists, politicians and citizens to put both the government and the opposition on notice. “We must show governments that we are not to be ignored through our actions as well as our words,” said Natalie Berry. The message was clear: if you do not commit to a future of clean air, water and energy, we will not vote for you. And the votes of these stakeholders make an important difference. The rally brought people from all across the state together. First Nations people led the rally, their chant “song lines not coal mines” summarising their stake in the issue and their anger at the mining proposals on sacred, traditional land. The Greens also had a strong contingent at the rally, with senators Mehreen Faruqi and Jenny Leong marching with the crowd. Children of all ages marched alongside their parents. Doctors for the Environment, Knitting Nanas and University Environment Collectives were all present. Cars travelling in the opposite direction were stopped in traffic due to the protest, but encouragement came from the drivers, with many opening their windows to yell, cheer and honk in support. The signs and banners that the crowd carried addressed a whole range of different issues, from CSG and investing in renewable energy, to Westconnex and ‘No Incinerator for Western Sydney’. On campus, the Enviro Collective will continue their fight for environmental justice this year, working to bring about a #FossilFreeUSyd and expose the University’s ties with coal and gas companies. “We want to empower students from all across the university to take action on environmental issues they find important,” said Berry.